In the last issue, we see Robin and Superboy approach by each other’s fathers, but before that, we are get more back story on Kid Amazo and his family. One thing we find out is that his family all had superpowers and they called themselves the Super Duffys. Back when the original Amazo was taken out by the Justice League, at the time evil Lex Luthor was able to get his hands on a synthetic version of the Amazo program, and was able to turn it into a human virus. The virus effected thousands, eventually a vaccine was made and used, 97% of infected was cure, and the 3% was Reggie and his family. All of this comes to light by Kid Amazo’s sister Sara, she all tells them Kid Amazo has gotten has hands on the amazo armor that was in lexcorp’s possession. A twist in the issue comes when Sara’s revealed to be an android made by her brother. Sara helps the Supersons fight against Amazo’s android clones, even with Sara’s help Superboy and Robin are still overwhelmed. 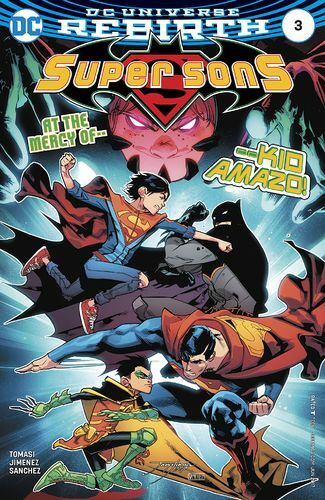 Conclusion: Given us a quick backstory about kid Amazo and Sara was good for plot purposes, what makes Supersons so funny is the relationship between Damian and Jon. Despite being in a dangerous situation Tomasi reminds us these two are just children. Look at Robin, teenagers that have experience a lot at a young age usually want to prove his or her independences, Jonathan kent on the other hand is the kid that’s raised with good values but was shelter by those same values, similar to his father. Now that Amazo has made his move to take out robin and Superboy, I expect the final showdown between the three of them in the upcoming issue. 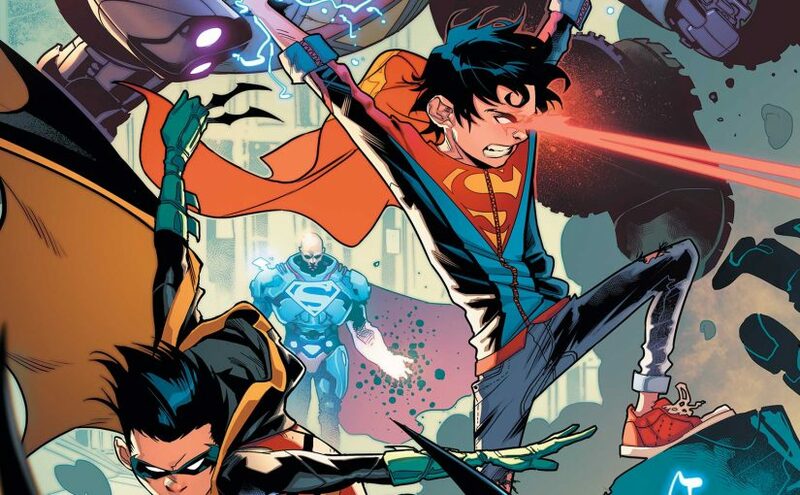 Review – Super Sons Rebrith #2: Who needs Batman and Superman!! With the last issue ending on a cliff hanger I was sure this issue would no doubt be entertaining, and I wasn’t wrong. One of the many bright spots in this run are the characterization and the artwork. 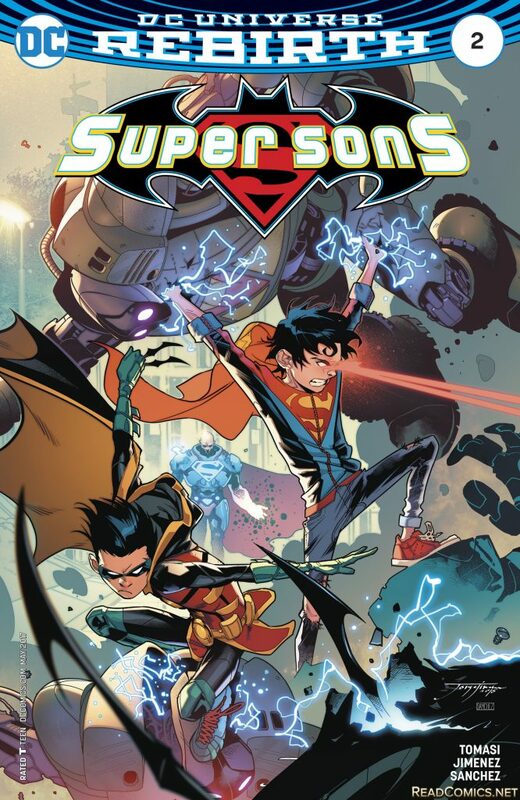 Supersons #2 delivers on all those with and more, first off, we get a prologue of Kid Amazo the main antagonist in the future, this kid has a serious anger issues, in a game of hide in seek, he finds and kills a family we are suppose assume is his. Jon and Damian’s encounter with lex is almost ends early when Damian uses Jon as a decoy. Once again Damian manipulates Jon into helping him, it seems as if Damian doesn’t really care for Jon’s safety, he purposely uses Jon as bait just so he can get access to Lexcorp’s data files, however do find it strange Lex has no idea who Jon and Damian are. After escaping Lex the two dig up some information on a kid name Reggie aka (Kid Amazo). Tracking Kid Amazo’s last position to a warehouse they investigate and find the family he had murdered in the prologue, right away Jon wasn’t to inform their dad’s, but Damian is determined to prove he doesn’t need Batmans help, the two of them argue and Jon leaves the scene and runs into a little girl who escaped during Kid Amazo crazy hide and go seek game outside the warehouse. The issue ends with Damian and Jon being watched by each other’s fathers. Conclusion: The one issue I have is that Jon is pretty much useless, he lacks any development, granted this could be on purpose, it’s still something to note. 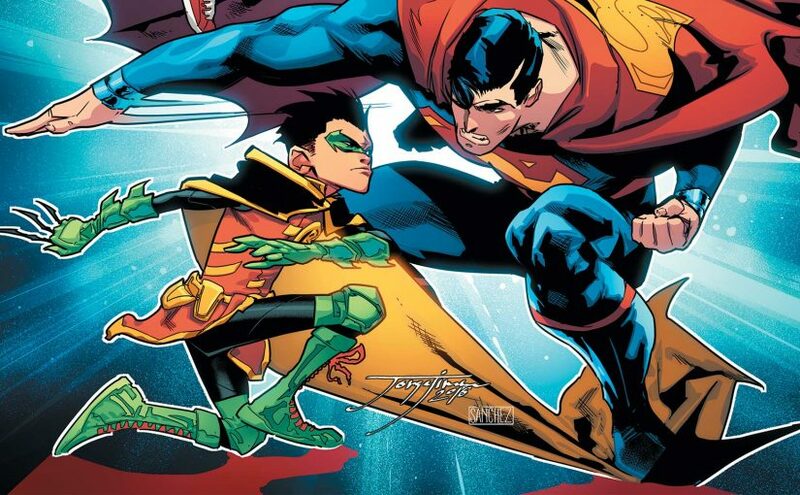 Damian on the other hand is a complete badass, with Tomasi doing the Batman and Robin runs its not surprising Damian’s the more developed character as of right now. The artwork once again is on point so theres no need to get into details about it, Jorge Jiménez is killing it. Overall we got some story progression, so hopefully in the future we see the two encounter Kid Amazo, I know I cant wait. Posted on March 18, 2017 March 27, 2017 Author Anthony DavisCategories Comics, Featured, ReviewsTags DC comics, DC Rebirth, Jorge Jiménez, Kid Amazo, Peter Tomasi, Robin, Super Sons, superboy, When I Grow UpLeave a comment on Review – Super Sons Rebrith #2: Who needs Batman and Superman! !